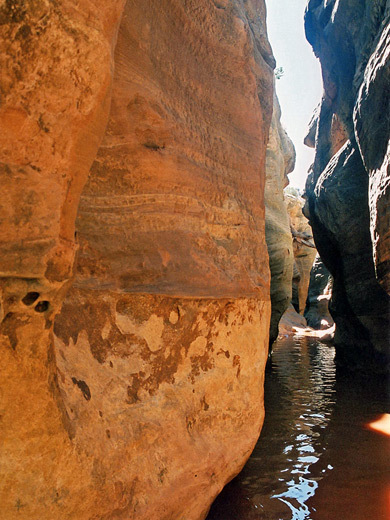 One of the largest branches of White Canyon is Cheesebox Canyon, a remote drainage with two forks totaling 15 miles, and while the lower stretches are not especially interesting, upstream has quite lengthy narrows containing permanently filled potholes, flooded channels and drop offs of several meters, some of which require rappelling to negotiate. A drive or hike deep into the wilderness is necessary to fully explore the canyon, which extends to the foothills of the Abajo Mountains, although the lower section is close enough to UT 95 to be visited as an easy day trip. Access to the southern end of Cheesebox Canyon is via White Canyon, starting near milepost 75 of UT 95, from where a short side track leaves the main highway and ends at a parking/camping area on a plateau overlooking the White/Cheesebox junction. The upper parts may be reached using the unpaved Cheesebox Road (county road 227), which leaves UT 95 at mile 67, crosses the bed of White Canyon - a spot that may require 4WD - and leads eventually into the Canyon Rims Recreation Area and the Dark Canyon Wilderness. There are several possible entrance points, but the usual one is 11 miles along this road beside the north end of Found Mesa, a long, thin sandstone outcrop that parallels the road to the west; at this point, a short side canyon allows entry to the left (west) fork of Cheesebox one mile upstream of the junction with the right fork. 20 views of Cheesebox Canyon. TopoQuest topographic map of Cheesebox Canyon. 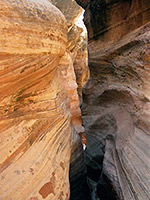 A cairned route descends from the parking area to the floor of White Canyon. This starts off to the right, winds back around a promontory then descends a steepish rock that is moderately difficult to come back up, traverses back to the right side and drops quite far then finally returns to the left and down to the streambed. Despite the cairns, the way ahead is not always obvious. 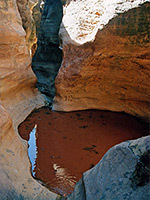 The mouth of Cheesebox Canyon is just opposite, though this is blocked by a short, muddy, overgrown stretch ending at a pool beneath a dryfall. This can't easily be climbed so instead the canyon may be entered by scrambling up the cliffs to the right, using a tree stump for assistance at one point, then back down the far side, arriving on a bench above a shallow, curving narrows section that precedes the falls. Upstream, the going is generally easy for a couple of miles but progress is slower than might be expected as the canyon has patches of soft sand, many large boulders, and trees, bushes and cacti that sometimes block the streamway. 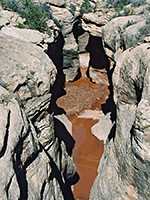 The rocks are part of the Cedar Mesa formation, here in various shades of red, white and grey. Eventually the ravine becomes a little narrower, more winding and less obstructed, with short rocky channels and plateaus marked by water-carved erosional patterns. A side canyon joins from the right, then the main passage continues without much elevation gain until the drainage enters a long, murky pool with a narrow crack in the cliffs that rise up just beyond. This can be bypassed by climbing up to the right - a route marked by cairns - and walking on a ledge above a 50 meter slot section which ends under a dryfall; the round trip to here is around 4 hours. Beyond this point, the canyon becomes temporarily wider once more then later has other short enclosed sections, pools and dryfalls but no significant extended narrows until a further 2 miles, near the point where the canyon divides into left and right forks. The Cheesebox Road parallels the canyon about half a mile to the northwest and allows relatively easy access via several entry routes to different parts of the gorge. For those without a 4WD vehicle, one alternative to road walking the full 11 miles to the side canyon entrance at the north end of Found Mesa is to take the path into the lower end of Cheesebox Canyon, walk upstream for about a mile, climb the cliffs on the north side and hike across the flat plateau, meeting the road 4 miles from the destination. The total distance by this route is around 7 miles and took me 4 hours; more interesting than walking along the road though probably taking about the same time. The side canyon is short, and deepens, as do most ravines hereabouts, via a series of sheer falls so an easy way in is not obvious. The best route is along the east side, across or around two shallow tributary ravines and almost as far as the edge of Cheesebox, then down the cliffs above the very lower end of the side canyon. One of the vertical rock layers appears to have only one way down, but the descent is generally straightforward. An alcove in the cliffs on the east side contains a small stone ruin, possibly Anasazi. 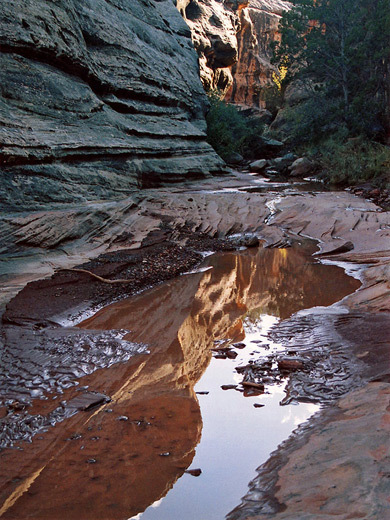 Upstream, the main canyon has nice narrows containing shallow pools and dryfalls. 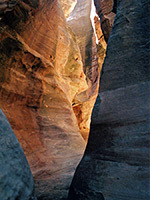 Rocks are curving and light colored, bearing thin, stripy patterns and well lit if the sun is in the correct position. Downstream is similarly pretty, and soon has one larger drop into a deeper pool before the slot opens out to a wider section with cottonwood trees in the streamway. The next 1.5 miles have many more narrows interspersed with open parts, but also places requiring rappelling, downclimbing, wading and even swimming, so for those not equipped for technical canyoneering, the amount of canyon that can be explored is quite short, yet it is still worth the long hike or drive to get there.